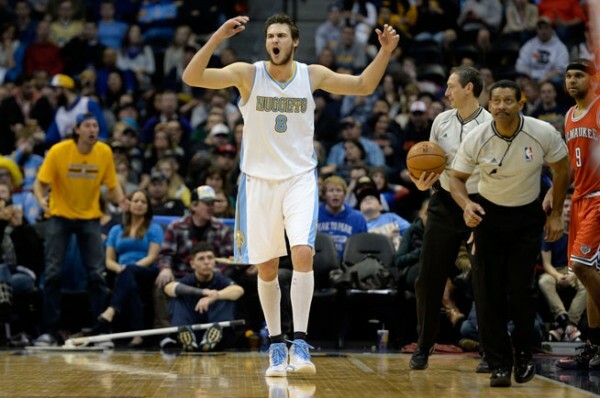 NBA Rumors – Denver Nuggets Extending Danilo Gallinari, Not Trading Him? Contrary to the narrative of this offseason, the Denver Nuggets seem to be keeping and even extending the contract of Danilo Gallinari instead of trading the Italian small forward. The Nuggets are sorta tanking, which means they’re rebuilding without tossing everything they have away for draft picks. Yes, they did get rid of Ty Lawson, but that wasn’t just for draft picks, and instead they may have come away with one or two talented players who might turn into a meaningful part of the Nuggets’ future. Kenneth Faried isn’t going anywhere and is the second highest paid player on the team behind Gallinari. The Nuggets aren’t going to be very good next season – they’re not going to make the playoffs unless Mike Malone pulls off some magical feats, but they’re counting on some of the players that have done well for them in the recent past (like Wilson Chandler as well) to keep on leading them in this transitional phase, along newcomers like Emmanuel Mudiay. Gallinari is entering the last season on his deal worth $11.5 million. The Nuggets are in discussions of extending his contract, overall pleased with how he’s bounced back from the injury that made him miss the entire 2013-2014 season. He averaged only 12.4 points per game last season, but his per minute numbers were the best of his career, and probably playing from someone who isn’t Brian Shaw will benefit him and the rest of the Nuggets.